There are tons of handy features that makes this website builder really distinctive. 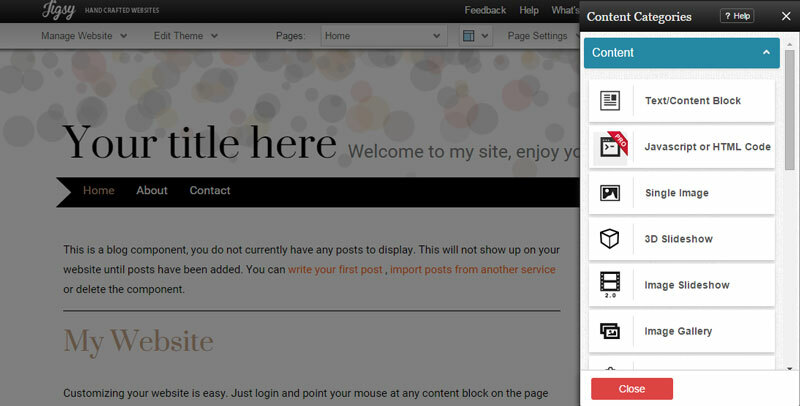 For example, the excellent drag-and-drop functions of Jigsy makes your web design experience smooth and productive. But even if you are advanced in CSS and HTML you can always use your skills and upload your own bootstrap carousel slider, then give it the finishing look with the website builder. There are various projects that Jigsy can support, such as eCommerce, blogs, galleries and almost anything that you can think of. In fact, you have to supply your own domain, because Jigsy do not provide free addresses. But let's get serious, who relies on them anyway? At last but not least you can also take advantage of a large number of themes for your web design needs or even create your own theme with all the necessary customization and unique look. The intuitive interface of this website builder and the drag-and-drop function makes it very easy to use even for complete rookies in the web design. However, most seasoned professionals will say "It's so annoying and you don't have control over the website." Well, Jigsy developers have thought of that and made it possible to access the code and control your web template effectively. Most of the ready-to-use templates are responsive and provide perfect solution for an inexperienced web developer. No hustle with broken CSS and half working themes, which break so bad once the screen width changes. Your website will be mobile friendly, that's for sure. Any Good for Search Engine Optimization? There is no special package in the themes for SEO purposes, but you can easily do your edits straight in the code. You can freely implement all your search engine optimization techniques which is even better than filling up fixed fields with limited capabilities. The website builder is free of charge and requires only a registration. Anyway, it's full potential is unlocked once you get a premium paid account. Various benefits are opened up for just 8,25$ a month. Jigsy website builder software is one of the best options for website building out there. This browser based solution for your web project is worth it, so even if you are not convinced about the premium version of the application. Well, you can always try it and decide for yourself.